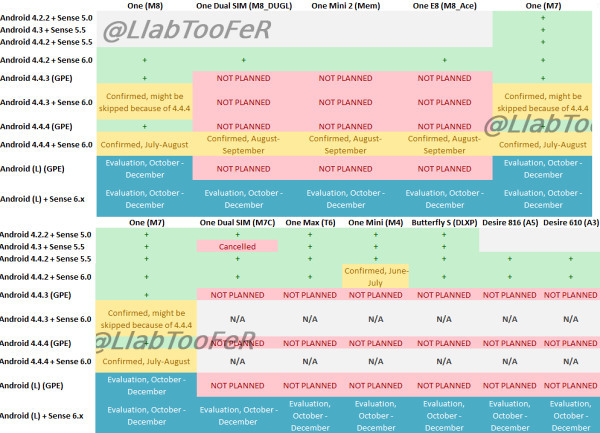 Thanks to infamous leaker @LIapTooFeR, we’re now able to have a look at HTC’s roadmap for their upcoming firmware updates. Looking at the roadmap, we know its going to be rather exciting for HTC’s smartphone users in the next few months. Several devices including HTC One (M7), One M8 (both single and dual SIM versions), One Mini 2, as well as One E8 will be receiving the latest Android 4.4.4 update along with Sense 6.0. However, we’re not sure why the dual-SIM version of the One M7 will not be receiving this update though. Sad to say there is still no hint on which device will be receiving the upcoming Android L update as they’re all still under evaluation according to the roadmap. We’ll keep you updated once these updates has begun rolling out, so stay with us!